The last time a hurricane was bearing down on the Hawaiian Islands, Steven Spielberg was on Kauaʻi finishing filming of the now iconic movie “Jurassic Park” when Hurricane Iniki hit the island as a Category 4 storm. On August 6 at 22:30 UTC (6:30 p.m. EDT) NASA's Aqua satellite passed over Hurricanes Iselle and Julio approaching Hawaii. Now — 22 years later — not one, but an unprecedented two hurricanes are making a beeline for the island chain and residents are preparing for a threat they rarely face. Hurricane Iselle, which retained hurricane strength after showing signs of weakening, is expected to make landfall as a Category 1 on the Big Island on Thursday night, bringing with it strong winds and torrential rains. If it stays a hurricane, it will be the first to hit the Big Island head-on since records began in 1950, and could even be the first since a possible cyclone hit in 1872, said National Weather Service meteorologist Michael Cantin. Hurricane Julio, further to the east of Iselle, looks to skirt to the north of the islands but the uncertainty in its track includes the potential to brush Maui and the other islands to the northwest of the Big Island as a tropical storm. 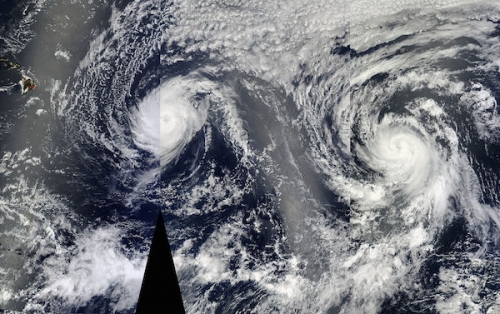 “It's quite rare to have two storms right behind each other . . . especially both as hurricanes! I don't think that has happened before,” Brian McNoldy, a hurricane researcher at the University of Miami, said in an email. The rarity of the situation and the long lull between these storms and Iniki, speaks to how unusual it is for Hawaii to be hit by tropical cyclones (the generic term for tropical storms and hurricanes), even though the island is synonymous with the tropics. That rarity is a product of where Hawaii is located. “The main thing is that Hawaii is kind of a sweet spot in terms of the weather,” Cantin told Climate Central. Hurricanes and tropical storms are normally steered clear of the Hawaiian Islands by a high pressure feature that is typically parked to the northeast of the islands and keeps the weather consistent throughout the year. That high pressure is particularly strong from May through October — prime hurricane season. But right now, that high is sitting a little further north than usual, allowing storms to take aim at the islands. Also helping shield Hawaii from tropical systems are the relatively cool waters around the islands, especially to the north and east of the chain. Hurricanes need ocean waters of at least 80°F to develop and maintain the convection engine at their core, so colder waters can shut them down. The waters around Hawaii at present aren’t cool enough to cause dramatic weakening of Iselle before it hits the Big Island. Forecasters expect the tropical storm-force winds of Iselle to begin lashing the Big Island in the late afternoon to early evening local time, with hurricane-force winds following later. The hurricane-strength winds are in a fairly compact area, but they could still pack a serious punch, as the island’s infrastructure hasn’t had to handle such ferocious sustained winds. 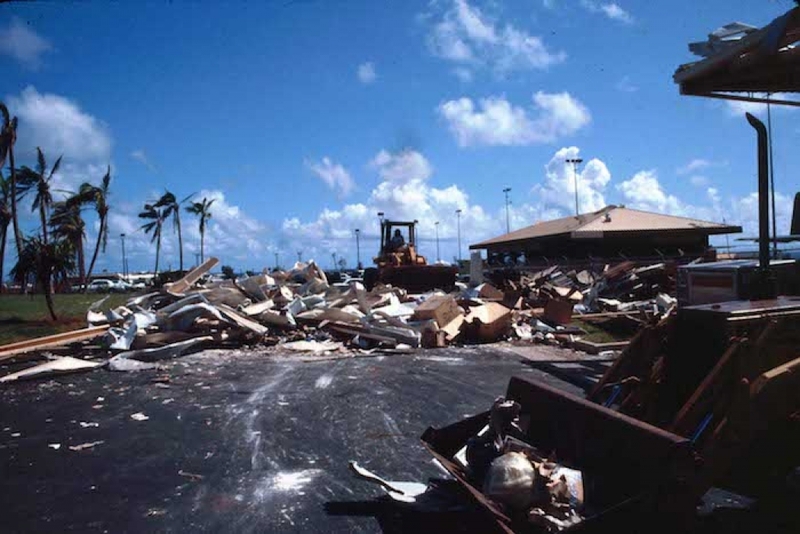 Damage to the Lihue Airport on Kauaʻi after Hurricane Iniki hit Hawaii as a Category 4 storm in 1992. Rainfall totals are expected to reach 5 to 8 inches across the islands, with some isolated pockets possibly seeing as much as 12 inches. The mountainous terrain of the islands amplifies the rain threat and contributes to the threat of ensuing flash floods and mudslides. As the moist air in the storm is pushed up Hawaii’s volcanic peaks, it will cool and the water vapor in it will condense, adding to the rain the storm already produces. The mountains “are where we'll see the highest rainfall totals and the strongest winds,” McNoldy said. The direct hit on the Big Island does present an interesting scientific prospect, in terms of monitoring how much the island’s topography tears apart the storm. “It’s unprecedented, we don’t really have a full grasp for what’s going to happen on the other side,” Cantin said. Like the other residents of Hawaii, meteorologists will have to watch and wait, hopefully stocked with at least three days of food and water for their families and prepared to lose power at least for a while. “I think we’re prepared as best we can be,” Cantin said.